Detailed guide with helpful information on Louisiana fees, requirements, licenses, and formation. Includes resources, FAQs, and downloadable checklist. Starting a small business in Louisiana can be rewarding. With one of the lowest business costs in the United States, Louisiana has proven to be a great place to launch a business. In 2018, Louisiana had nearly 500,000 small businesses, employing over 900,000 employees. 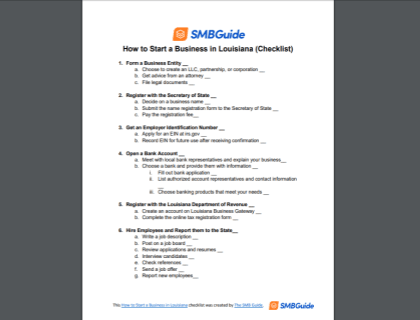 A detailed list to keep you on track while you launch your Louisiana business. Sole proprietorship: No legal difference between the owner and the business. Does not require filing with the state. Partnership: A legal agreement between two or more individuals who share management and earnings. Limited Liability Company (LLC): Protects the personal assets of the owners from business liability. 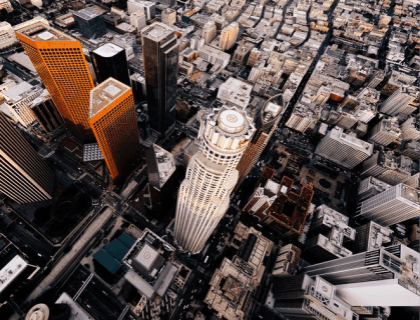 Corporation: A formal structure that is recognized as a single entity. Run by a group of officers known as the board of directors. In addition, distinct versions of some business structures, such as limited partnerships and S corporations, are available. You must determine your business structure in order to formally establish your business. For small business owners, an LLC is the recommended business structure. With an LLC, business owners are not required to file a corporate tax return. The structure is also easy to set up and manage. You can set up an LLC in the state of Louisiana for $100.00. By law, you must register your business name with the Louisiana Secretary of State (SOS). However, you need to first verify that your name is distinct from the names of other businesses already registered. You can check if your business name is already on file by doing a business entity search on the SOS website. A business name can be reserved for 120 days. You can register your business name by mailing a name reservation form or by going online to reserve at the geauxBIZ website. If your business plans on hiring employees, you must obtain an Employer Identification Number (EIN) from the IRS. Also known as Federal Tax ID Number, your EIN may be required by banks to open an account in the business’s name. To get an EIN, you can complete an online application on the IRS website. You can also get an EIN by mail or fax. There is no filing fee required. In order to keep your accounting organized, consider opening a separate bank account for your business. Contact your local banks to consult with an expert on the different business accounts on offer. First Federal Bank of Louisiana. 5. Register with the Louisiana Department of Revenue. Before you sell goods or provide taxable services in Louisiana, you will need to register with the Department of Revenue (LDR) for a sales tax license. In addition, if you want to hire employees, you must apply for employer withholding taxes. To register for a sale tax license, you can go online via the GeauxBiz.com site. Alternatively, you can register for both taxes via the Business Registration page on the LDR website. By law, employers are required to report new hires and returning employees to the Louisiana Directory of New Hires within 20 days of the employee's first day. This process is mandatory every time you hire a new employee. To file an online report, you can visit the Louisiana State Directory of New Hires website. You also have the option to fax or mail the W-4 or equivalent form. Mailing information is available on the new-hire form. 7. Obtain appropriate state licenses and permits. In Louisiana, not every business requires a generic license. However, many types of businesses may need additional licensing or permits. Depending on your business, different regulatory licenses and permits need to be issued by different state agencies. For example, to open a bar, you will need a liquor license from the Louisiana Office of Alcohol and Tobacco Control. There are license and permit terms for almost every type of business. To view the full list of licenses and permits, visit the geauxBIZ website. Any business owner who hires one or more employees, whether full or part-time, must carry workers' compensation insurance. Domestic workers are exempt. Other exemptions may also apply. For more information, contact the Louisiana Office of Workers' Compensation Administration. In addition, Louisiana law requires that all drivers carry minimum automobile insurance. As time passes, it's important to stay up to date with the latest regulations affecting your specific industry and/or business entity. Louisiana LLCs are required to file an annual report with the Secretary of State. The annual report is due on or before the anniversary of your LLC's formation. You can file the report online at the SOS website. To mail the report, go to geauxbiz and print out the annual report. Mailing information is available on the form. The current filing fee is $30.00. A corporation must also file an annual report with the Louisiana SOS. The report must be filed every year by your corporation's registration anniversary. There is a $30.00 filing fee. How much does it cost to register a business name in Louisiana? It costs between $75.00 - $100.00 to register a business with the Louisiana Secretary of State. Where can I apply for a Louisiana sales tax license? To apply for licenses and permits in Louisiana, you can go to the geauxbiz website. Are there any specific rules for an LLC in Louisiana? To form an LLC in Louisiana, you need to file Articles of Organization with the SOS. The filing fee is $100.00. Even though it's recommended that businesses get an operating agreement, it is not required in the state of Louisiana. Yes. Louisiana law requires that all employers who hire one or more employees carry workers' compensation. How do I register a business name in Louisiana? You can register your business online with the Louisiana SOS.